The vascular system is made up of the vessels that carry our blood. Arteries carry oxygen-rich blood away from the heart. Veins carry oxygen-poor blood back to the heart. This applies to the vessels in the lower and upper extremities. The reverse is true in the circulation leading to the lungs: the pulmonary arteries take oxygen-poor blood to the lungs ; the pulmonary veins bring oxygen-rich blood back to the heart. 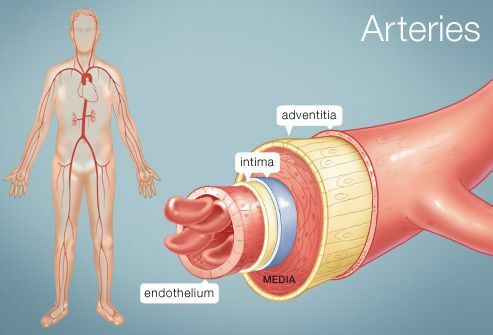 Arteries have three well defined layers, the intima (innermost layer), media (muscular layer) and adventitia (outermost layer). Veins transport blood at much lower pressures and therefore are not structurally as strong as arteries. They also have three layers. However, the layers are thinner and the muscular layer is much less prominent. Vein Treatment Center and www.VeinsVeinsVeins.com is the first in Western New York and the first of 10 comprehensive Vein Treatment Centers in The United States to perform the ClariVein procedure. Hratch Karamanoukian, MD FACS is a board certified phlebologist (vein specialist) and director of the Vein Treatment Center with offices in Williamsville, New York and Clarence, New York. Dr. Karamanoukian is proud to announce that he has been performing the Clarivein procedure which is a mechanical chemical ablation (MOCA) technique for the treatment of superficial venous insufficiency and varicose veins. Vein Treatment Center is proud to announce that the Clarivein procedure since May 2012 an alternative method to treat varicose veins and venous insufficiency. Dr. Karamanoukian also uses the VenaCure EVLT Never Touch laser system to treat saphenofemoral and saphenopoliteal venous insufficiency. He also uses the VNUS Closure procedure as an alternative method to treat venous insufficiency. The Vein Treatment Center offers comprehensive vein treatment services and provides state of the art treatment options for all types of venous disorders including venous insufficiency, varicose veins, reticular veins, and spider veins. Treatments include foam sclerotherapy with or without ultrasound guidance, microsclerotherapy, sclerosurgery, microphlebectomy, ClariVein, VNUS Closure and the EVLT Never Touch procedures. At the Vein Treatment Center, every patient is treated by board certified physicians and staff. We offer prompt physician consultations and accept all types of insurance including Medicare. Self referrals and second opinions are welcomed at the Vein Treatment Center. Dr. Karamanoukian has written 41 books, 7 of which are about venous disorders. His latest publication is with the American College of Phlebology, the premier society for board certified physicians in the United States. A free copy of his latest book Healthy Veins … Healthy Legs can be obtained by calling Dr. Karamanoukian 716-839-3638 or contacting him directly by going to www.VeinsVeinsVeins.com. Hratch Karamanoukian, MD FACS has offices in Williamsville, New York and Clarence, New York. Offices are open Monday through Saturday. Dr. Karamanoukian is board certified in cardiothoracic and vascular surgery (American Board of Thoracic Surgery), general surgery (American Board of Surgery) and phlebology (venous diseases and lymphatic disorders) – American Board of Phlebology.